The City of London is mentioned in the Dr Syn stories as the Seawall Tavern. In 1775 there was a great storm where a ship called 'The City of London' was shipwrecked off the coast of Dymchurch. There was great loss of life and the storm was so great that the ship was tossed over the seawall, it crashed into the tavern causing great damage to the building. 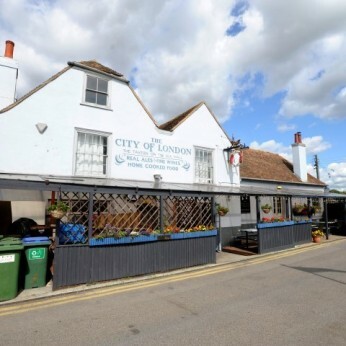 The tavern was restored using timbers from the wreck and in commemoration for all the people that were killed the tavern changed it's name to 'The City of London'. Every Tuesday our homemade pies are just £8 between 12-3pm & 6-9pm. They are served with a choice of chips or mash plus peas. Please phone 01303 873979 or message us to reserve your table.